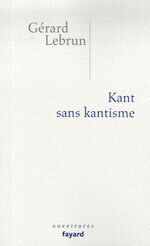 Recensé : Gérard Lebrun, Kant sans kantisme, préfaces de Paul Clavier et Francis Wolff. Paris, Fayard, 2009, 341 p., 22 euros. Gérard Lebrun n’a jamais autant publié que depuis sa mort, survenue en 1999. Les deux seuls livres qu’il fit paraître en français, ouvrages de référence, ont été réédités en 2003. Ils furent ainsi rendus à ceux qui, désireux de saisir la radicalité de l’intervention kantienne dans l’histoire de la métaphysique (Kant et la fin de la métaphysique, Armand Colin, 1970, rééd. Le Livre de Poche), ou la singularité du régime de discours hégélien (La Patience du concept, Paris, Gallimard, 1972, rééd. 2003), ne pouvaient faire l’économie, non pas seulement d’une lecture, mais bien d’une authentique méditation de ces livres qui ne quittent jamais totalement ceux qui les ont rencontrés. La rareté francophone de Lebrun ne s’explique pas seulement par le souci de perfection de quelqu’un qui écrivait en esthète, ni par cette intégrité qui interdit de publier pour ne rien dire. Il faut ajouter qu’il vécut longtemps au Brésil, où il jouit encore d’une aura particulière. C’est grâce à deux de ses anciens élèves, Paul Clavier et Francis Wolff, que le lecteur non lusophone a pu découvrir L’envers de la dialectique (Paris, Seuil, 2004), d’abord paru en portugais. C’est grâce à eux encore qu’il dispose désormais d’un recueil d’articles parus en français, en portugais, ou encore inédits, jalonnant 25 ans de travail (le plus ancien date de 1974, le plus récent de 1999) : Kant sans kantisme. Why should every philosophy be expected to address politics just because all philosophers are affected by politics? “Ontology is play-science for philosophers,” says the I.T. post in question, and I can’t help but agree. But I don’t see why “real” scientific work should be regarded with suspicion just because scientists don’t explicitly discuss in their scientific articles the political and economic factors that influence the trajectory of their work. To the contrary: I would be particularly suspicious of chemists or physicists who claimed that their scientific work and findings were influenced by their political position. I think, though, that the objection is more direct than that: ontology is pointless, like alchemy; go make better use of your philosophical talents. What happens, or what does not happen, should be what concerns us: philosophers sometimes pride themselves on their ignorance of world affairs, again like watered-down Heideggarians, no matter how hostile they think they are to him, pretending that all that history and politics stuff is so, like, ontic, we’re working on something much more important here. I am waiting for Objectologist the Son to shoot out one of those “I feel betrayed and misunderstood” posts any second now. Some reactions and comment on the post are here. Ich habe im Augenblick wenig Lust [etwas gegen Hegel zu schreiben], und Hegels metaphysischer Pilz ist ja nicht in den Gärten der Wissenschaft, sondern auf dem Misthaufen der Kriecherei aufgewachsen. Bis 1813 hatte seine Metaphysik die Franzosen, dann wurde sie königlich württembergisch und jetzt küβt sie dem Herrn von Kamptz die Karbatsche. Wenn er Beifall findet, so ist dies nur ein Beweis der wissenschaftliche Ungebildetheit und der Geistlosigkeit des Publikums, von welchem er gehört wird. Wissenschaftlicher Ernst wird gegen diesen Propheten unter den Bütteln nicht die rechte Waffe sein. Überhaupt muβ es ja in dieser Zeit des politischen Katzenjammers, wo jede freie oder auch nur fröhliche Äuβerung verdächtig gemacht wird, einem jeden ekelhaft sein, öffentlich über politische Gegenstände zu sprechen. How many scholarly stakes in the heart will we need before Martin Heidegger (1889-1976), still regarded by some as Germany’s greatest 20th-century philosopher, reaches his final resting place as a prolific, provincial Nazi hack? Overrated in his prime, bizarrely venerated by acolytes even now, the pretentious old Black Forest babbler makes one wonder whether there’s a university-press equivalent of wolfsbane, guaranteed to keep philosophical frauds at a distance. Whoa. Nothing like a little ad hominem attack to get things going. Sure, Heidegger’s rhetoric is a bit bloated much of the time, but in fact, this paragraph kind of de-legitimizes anything else the author, Carlin Romano, writes afterward. The connection (identity, really) between Heidegger and Nazism has been picked over and I’m not so sure that Romano is correct to say that there’s been some sort of deliberate systematic disavowal of it on the part of academics. Anyhow, Romano’s polemic is centered around the forthcoming translation of Emmanuel Faye’s Heidegger: The Introduction of Nazism into Philosophy in Light of the Unpublished Seminars of 1933-1935. Faye’s claim, as far as I can tell, is that Heidegger wasn’t “caught up” or “flirting” with Nazism, but instead, was a theorist or philosopher of Nazism. Hmm. Baby. Bathwater. I don’t think it’s particular helfpul (or accurate) to reduce the whole corpus of Heidegger’s work to mere “hate speech.” Both Faye and Romano almost sound like those screaming health care protesters by insisting that publishers (er..Indiana UP and Continuum) stop publishing Heidegger and all of those librarian sympathizers need to cut it out with all this stocking up of Heidegger’s Gesamtausgabe in order to prevent Nazism from encroaching into the public realm and poisoning the minds of the unexpected. I hardly think Heidegger’s Nazism or minimally, Heidgger’s connection with Nazism should escape serious and legitimate scrutiny, nor should it be defended, but if Faye’s book is half the hatchet job I’ve heard it to be, then it’s not very helpful. That said, I will read the book with a good deal of interest. The performance was quite solid, I think, and it’s almost impossible to screw up Aida, especially in such a traditional production with all that gold and Egyptian costumes stuff everywhere. I think everyone sang quite beautifully, but then again I’m no expert and as soon as I hear a familiar tune, I’m quite satisfied (unless the singer gets of rhythm or screws up a note here and there which often happened to the high priest fellow).